Life did not go according to Joseph’s plans. He was ready for marriage and family. Then the unexpected and unbelievable happened: Mary was pregnant. He was confused and deeply hurt. But above all, he wanted to protect her, to keep her from harm because he loved her. Then he had a dream from God that explained everything. He took her into his home as his wife. We celebrate St. Joseph’s feast day on March 19. The only authentic facts we have about Joseph are from the Gospels of Matthew and Luke. They show what a selfless, loving, responsible husband and father he was. Theirs was a virginal marriage. 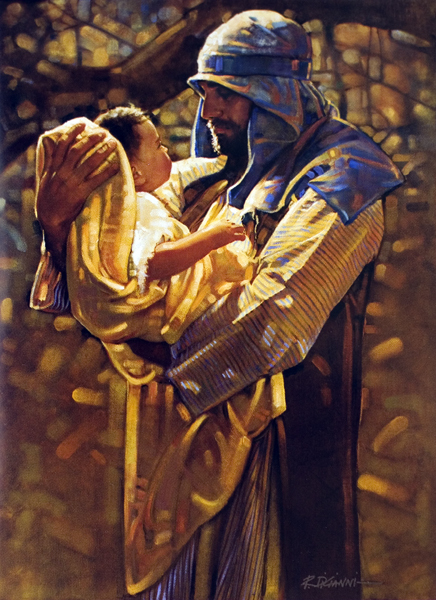 Joseph was not the biological father of Jesus, but with love he carried out his fatherly responsibilities. When called to Bethlehem to register for Herod’s census, Joseph did everything he could to make the trip of about 90 miles easier for his pregnant wife. 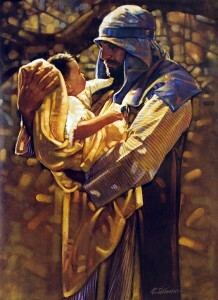 He was there for the birth, supporting Mary and keeping her baby warm and safe. As the father, he arranged for the circumcision and named the child Jesus as the angel told Mary. Joseph and Mary presented Jesus to the Lord in the Temple and offered a sacrifice of a pair of turtledoves. Joseph left for Egypt the very night the angel in a dream told him that Herod wanted to kill Jesus. When the angel told him it was safe, Joseph took them back to Nazareth. Joseph was a happy man. Why shouldn’t he be? Mary loved him and he loved her. He loved to hold Jesus and make him laugh. They cheered him on when he took his first steps. We can only imagine the day-by-day delights as they watched him grow. Young boys naturally mimic their dads. Imagine Jesus watching and learning safe carpentry rules from his earthly father. When he was 12, Mary and Joseph took him to Jerusalem for the Passover. On their way home, they were frantic when they couldn’t find him. Joseph was not totally surprised when they discovered Jesus in the Temple, listening to the teachers and asking them questions. Mary asked him, “Son, why have you done this to us? Your father and I have been looking for you with great anxiety.” Misunderstandings happen in even the best of families. He came home with them to Nazareth and grew in wisdom and grace. He loved his parents and obeyed them. Joseph taught him his trade and he was known as the son of Joseph the carpenter. Joseph died with Mary and Jesus at his side. Today’s fathers and husbands are often faced with household tasks that far exceed their mechanical and technical skills. But perform they must. A parishioner once told me that he always started a challenging household job by asking St. Joseph for help and guidance. I think of him as a very happy man here on earth and now with his wife and son in heaven.